ASEAN leaders proclaimed to create an ASEAN Economic Community by 2015. But achieving the target requires cooperation and coordination both within and among the ten ASEAN economies. Currently, with countries having varying considerations towards complete liberalization, protectionism still persists in certain sectors of the economies. Lot of work needs to be done in addressing the domestic reforms, the gaps in infrastructure, the lack of human resources and adequate institutions. Moreover, it is the businesses whose decisions and actions will help the region to achieve an effective integration. The launch of the ASEAN Economic Community raises key issues: the deepening of regional trade and production sharing, and the associated problem of exchange rate management. This volume questions the capacity of a shallow institution to deal with complex consequences on employment and inclusiveness, creativity and connectivity, and inequality and social cohesion. At a time when broader agreements are competing for regional leadership, contributors debate whether ASEAN can serve as a model of integration or else be diluted in wider Asian and Pacific arrangements. Approaches combine economics, history, geography, and political science to provide a clear understanding of ASEAN's potential and weaknesses in technical and non-technical but always readable terms. Given the rapid emergence of regional economic arrangements in Asia, especially in Southeast Asia, it is useful to understand clearly what regionalism implies for the region, as well as to take stock as to the far-reaching and complicated effects of formal economic cooperation and integration. This book allows the reader to better understand the relevant international policies of the Southeast Asian economies, and to appreciate the potential lessons for other developing regions. It also focuses on the regionalism trend with an explicit application to ASEAN, as well as the implications of regionalism in the developed countries.The goal of this book is to survey the economics and political economy of regionalism in the ASEAN context from a variety of perspectives and using various techniques, from standard economic analysis of preferential trading arrangements to the political economy analysis of institutions. Its approach is comprehensive in that it includes ASEAN economic integration in the areas of trade, foreign direct investment, and finance. Presentation of the material is designed to be accessible to non-technical audiences without sacrificing the rigor expected by economists and other experts.Contents:Introduction and OverviewTrends in ASEAN Economic Cooperation:ASEAN Economic Integration in a Global Context: Trade, Investment, and Policy IssuesAligning ASEAN Commercial Policies in the AECASEAN Investment CooperationBond Market Development and Integration in ASEANASEAN Stock Markets: Trends in ConvergenceRelations with Dialogue Partners:Integration Strategies for ASEAN: Alone, Together, or Together with Neighbors?The ASEAN Economic Community and the European ExperienceASEAN and the United States: The Economics of the Enterprise for ASEAN InitiativeReadership: Academics, economists, policy makers and private sectors interested in Asian cooperation issues. This book consists of 20 short essays on different dimensions of international economic policy with specific (though not exclusive) focus on Asia. Topics covered include: exchange rate regimes and reserve buildup in Asia; global macroeconomic imbalances; financial sector liberalization; international capital flows to and from Asia; infrastructure financing in Asia; foreign direct investment (FDI) flows, production networks, manufacturing and outsourcing in Asia; the economic rise of China and India; and trade, financial and monetary regionalism in Asia. While the book covers important and often technical economic issues of contemporary policy relevance, it is written in a manner that is easily accessible to non-economists, including students of public policy, international affairs, international commerce and business, as well as policy-makers and interested observers.Contents:Monetary and Exchange Rates Issues:Asia's Embarrassment of Riches: A Story of Prudence, Global Imbalances, and Some Good Old Fashioned MercantilismThe Known Unknown: The Whopping US Current Account Deficit and Its Implications (With Surabhi Jain)Will the US Dollar Remain ‘Top Dog'? : The Billion Dollar Question (With Jose Kiran)A Central Banker's Holy Grail: Inflation-Targeting Frameworks with Reference to Asia (With Tony Cavoli)Singapore's Currency Baskets and the Mantra of Competitiveness: The Importance of Real Exchange RatesFinancial Liberalization, Financial Crises and the Financing of Development:Barbarians at the Gates: Foreign Bank Entry in AsiaThe Tobin Tax: A Panacea for Financial Crises?International Capital Flows to Asia: The Never-ending Magic Spigot?Using Reserves to Finance Infrastructure in India: Will it Clear the Gridlock?The Goldmine of Development Finance: Reassessing the Importance of Migrants'RemittancesTrade, Investment and the Rise of China and India:The “Do's and Don'ts” of Attracting Foreign Direct InvestmentChips from East Asia, Hardware from Southeast Asia, and Assembled in China: Production Sharing and Trade in AsiaAll Paths Lead to India: Do Other Asian Countries Pose a Challenge to Its Dominance in Services Outsourcing? (With Sadhana Srivastava)The Rise of the Indian Manufacturing Sector: A True Underdog StoryWill the Big Tiger Leave Any Crumbs for the Little Dragons? China vs Southeast AsiaEconomic Regionalism in Asia:Embracing One's Neighbour: Redefining the Importance of India to ASEANGoing It Alone: Singapore's Trade Strategy (With Rahul Sen)ASEAN Economic Integration: Taking Care of BusinessUncooperative Cooperation: The Saga of Economic Cooperation in South AsiaMonetary and Financial Cooperation in Asia: More than Just Buzzwords?Readership: Policy-makers, professors and students of international economics and political economy; investment bank/private sector industry economists and business leaders. Lee, Minsoo Park, Donghyun Saunders, Harry D.
Asia was probably the biggest economic sensation of the post-war decades. The breathtaking success of Japan was followed by a remarkable rise of " four tigers" , then ASEAN founder states and then China. The Asian miracle became a commonly accepted definition of this success. In the late 1970s and especially 80s it became clear that the balance of power in the world had changed. Politicians, businessmen, scholars began to talk about " the new Asia Pacific age" and Asian economic model, different from and, maybe, even superior to Western capitalism. However, in 1997-98 the Asian economic crisis came and made the region a sick man. Six years before that Japan, the regional powerhouse entered more than a decade-long period of stagnation. The miracle was over. However, the crisis was overcome within a surprisingly short period of time. Naturally, the question arises: What now? What is going on in the region after the miracle and after the crisis? What is today's face of Asian capitalism and how should we view its performance? Readers interested in regional developments will find a lot of literature about miracle decades and crisis years. However, few analysts have addressed the challenging questions addressed in this book. The authors vividly show that Asian capitalism is undergoing a radical structural transformation. These changes are directly affecting its key institutions: governments, companies, labor relations, etc. As a result Asian economic systems are becoming much closer to the Western-style, especially Anglo-Saxon capitalism, though the region retains some important specific features, especially regarding business culture. This book is a must for business people worldwide, for all those who study the region in colleges and business schools, for people engaged in various international activities and, finally, for all those who want learn more about our world at the dawn of the new century. This volume is the outgrowth of a conference held at Peking University in May 2002, jointly sponsored by the American Committee on Asian Economic Studies, the Peking University School of Economics, and the China Reform Forum. The contributors include leading scholars from Asia as well as specialists on Asia from the US, Europe, and Australia. The book delves into issues of trade and investment, exchange rates and macroeconomic policy, and preferential trade agreements and other forms of economic cooperation. The overall message is one of regional dynamism animated by concerted efforts to build a favorable institutional environment. China is a great motivating force in this dynamism and a key player in the development of regional agreements.Contents:Introduction: China's Economic Presence (C Wiemer)Regional Economic Integration:Inaugural Address (M-H Shin)Globalization: What It Is and Who Benefits (D G Johnson)Prospects for an Asian Currency Area (R Mundell)The European Central Bank and the International Role of the Euro (J Schroeder)Asian Economic Community: Intra-Community Macro- and Micro-Economic Parameters (M Dutta)East Asian Economic Cooperation: The “10+1” Mechanism for Moving Forward (J Ye)Pax-Americana-Led Catch-Up, Flying-Geese Style: Regionalized Endogenous Growth in East Asia (T Ozawa)Asian Economic Integration: A Perspective on South Asia (S M Khan & Z S Khan)Asian Policy and Performance:Can East Asia Rise Again? (T-S Yu)Identifying Terms of Trade Effects in Real Exchange Rate Movements: Evidence from Asia (M Dungey)Industrial and Commercial Firms'Response to the Asian Crisis: A Logistic Approach (S Reynolds et al. )Moral Hazard and Legal Regulation in the Financial Market: Japan's Mega-Bank Mergers (Y Shimizu)Focus on China:Bank Regulation in China: Property Rights, Incentives, and Accountability (Y Guo)Foreign Direct Investment in China: An Analysis of Source Country and Sector of Utilization (W Wei & M Dutta)Agglomeration Economies and FDI Spatial Distribution: Evidence from Joint Ventures in China (C Tuan & L F Y Ng)Korea–China Technological Cooperation (Y-T Lim)ASEAN–China Free Trade Area: Background, Implications and Future Development (S Chirathivat)Preferential Trade Agreements and China's Trade (R Clarete et al. )Readership: Scholars and practitioners in Asian economies. This is the only English language publication with a distinctly Northeast Asian (outside Japan) and Chinese perspective on pan-East Asian Regionalism (including both Northeast and Southeast Asian Regionalism) published within the last 5 years that is distributed internationally. It traces the development of Asian regionalism and analyzes China's role and policy on East Asian cooperation and integration. The 15 chapters in this volume directly involve all major policy researches and project designing in the process of the East Asia cooperation. They provide valuable information for knowing, understanding and studying the ongoing process of regional cooperation in East Asia.Contents:East Asian Cooperation: Path & ApproachEmerging East Asian RegionalismProjecting East Asian Community-BuildingEast Asian Cooperation: Where is It Going?Northeast Asian Community: Is It Possible to Turn Vision into Reality?The Development of East Asian FTA China's FTA Strategy: An Overview Designing East Asian FTA: Rational and FeasibilityHow to Promote Monetary and Financial Cooperation in East AsiaThe Asian Financial Crisis and Regional Cooperation Environment and Energy Cooperation in East Asia China's Economic Emergence and Regional CooperationChina's Accession to WTO and Its Impact on China–ASEAN RelationsChina–ASEAN FTA and Its ImpactComparing China and Japan in Developing Partnership with ASEANReadership: Academics, researchers and students interested in the development of the East Asian Cooperation Movement. Zheng, Yongnian Tong, Sarah Y. The current global financial turmoil, triggered by the US subprime crisis, has spread quickly and resulted in the worst global economic crisis since the 1930s. As the world's third largest economy and the second largest trading nation, China is inevitably affected seriously. How China responds to the crisis and how effective its measures are in sustaining a healthy growth will have important implications, both domestically and internationally.The chapters in this volume are divided into five sections. Section one examines the overall impact of the global economic crisis and the responses of the Chinese government. Section two studies the regional aspect of the economy affected by the crisis. Section three explores such economies of the Mainland's southern neighbors as Hong Kong, Macao and Taiwan, and the prospect of China's trade. Section four surveys the impact on the ideological and social aspects of the country. Section five concludes with an assessment of China's external policies. The volume offers a comprehensive and in-depth assessment of the impact of the crisis and the measures of the Chinese government to overcome the difficulties. Contents:China's Economy 2008 and Outlook for 2009: Crisis of a Sharp Slowdown (J Wong)Recession Averted? China's Domestic Response to the Global Financial Crisis (M Yang & T S Lim)China's Decisive Response to the Economic Crisis Bears Fruits (S Y Tong)Pearl River Delta in a Crisis of Industrialization (Y-J Huang & S F Chen)Impact of the Global Economic Crisis on the Pearl River Delta and Yangtze River Delta Regions (H Yu)Taiwan's Economy in the Financial Crisis and Its Outlook (H Zhao)Hong Kong's Economy on the Road to Recovery? (Y Zhang)Financial Crisis Offers Respite for the Macao Economy (Y Zhang & F Kwan)China's Trade Prospects and China-ASEAN Trade Relations (S Y Tong & S K Chong)Sino-South Korean Bilateral Trade in the Current Economic Crisis (S-Q Zhou)Ascendence of China's New Left Amidst the Global Financial Crisis (Z-Y Bo & G Chen)Will Social Stability in China be Undermined in the Financial Crisis? (L-T Zhao & Y-J Huang)The International Financial Crisis and China's External Response (Y-N Zheng & L F Lye)Readership: Economists, political scientists, sociologists, advanced undergraduates and graduate students interested in China's politics, economy and society. This volume is an updated survey and assessment of the recent policy initiatives of Hu Jintao and Wen Jiabao, which have come to be known as the Hu-Wen's New Deal. Individual chapters are written by scholars from different academic disciplines and backgrounds. These scholars hail from Singapore, the United States, Australia, Korea, Hong Kong, Taiwan and Mainland China.Topics cover the patterns and process of leadership succession, emerging political factions, social unrest, sources of economic growth, income disparities, social security reform, land use policy, banking reform, corporate governance, labor and population policies, rule of law, and changes in the Party and ideology. On the external aspects, discussion includes China's changing relations with the U.S., Japan and ASEAN. In many ways, the Hu-Wen leadership today is still coming to grips with the same issues and problems as discussed in this book.Contents:Introduction:The Hu-Wen New Deal (J Wong & H Lai)Strengthening Governance and Rule of Law:Hu Jintao's Consolidation of Power and His Command of the Gun (J You)Deciphering Hu's Leadership and Defining New Elite Politics (C Li)Hu Jintao's Approach to Governance (J Fewsmith)Re-Making the Party's Image: Challenges for the Propaganda Department (Y Zheng & L F Lye)Reforming the Party and the State Under Hu Jintao (S-C Hsu)Rule of Law and Governance (K Zou)Sustaining Economic Growth and Reform:New Patterns of Economic Growth (Y Wu)Changes and Reform in Financial Markets (H Davies)Strengthening Corporate Governance: Completing the Unfinished Business of SOE Reform (S Y Tong)The Effects and Implications of Foreign Direct Investment in China for Other Developing Economies: Hollowing Out or Filling in? (B Chantasasawat et al. )Changing Land Policies: Ideology and Realities (J Wong & R Liang)Coping with Social Issues and Tensions:Income Inequalities, Limited Social Mobility and Remedial Policies (H Lai)Labor Market Reforms Under Hu-Wen Administration (L Zhao)Managing Social Unrest (Y Cai)From Social Insurance to Social Assistance: Welfare Policy Change (E X Gu)Governments, Markets, and the Health Care Sector (? Blomqvist)Population Development Strategies: The New Thinking (X Peng)Managing China's External Relations:Bush's Asia Policy and US-China Relations (Q Zhao)China and Northeast Asian Cooperation: Building an Unbuildable? (J H Chung)China and Southeast Asia Cooperation: New Developments and Challenges (H Zhang)Readership: University and academic libraries, experts in politics, diplomacy, economics, law and sociology analysts, officials, journalists and segments of public interested in China. Cheng, Tun-jen Delisle, Jacques Brown, Deborah A. 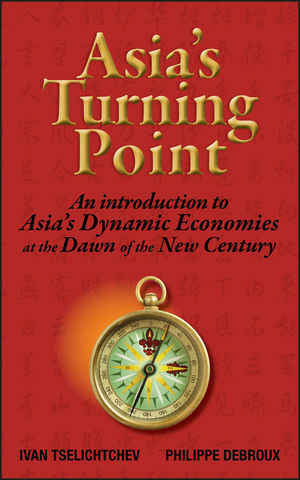 The fourth generation of leaders of the People's Republic of China, while benefiting from the prestige of China's entry into the World Trade Organization and the honor of hosting the 2008 Olympic Games, also needs to contemplate the sobering side-effects of a rapid and internationally-interdependent economy and a troubled and only partly reformed political system.This important book approaches the study of the PRC under Hu Jintao in a two-fold manner: by examining the new political parameters within which the party-state functions and by analyzing the prominent issues — at home and abroad — that are commanding the attention of China's new leaders. 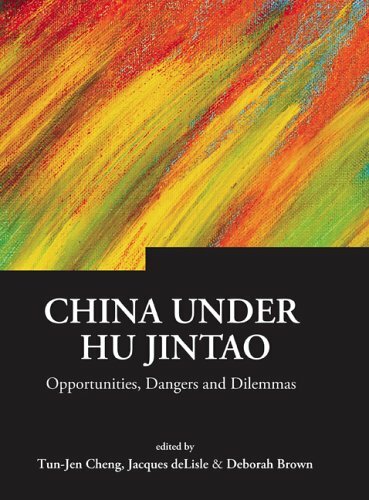 The book tackles a comprehensive range of topics, including elites, institutions and state-society relations, politics and the political implications of economic change, domestic politics and foreign relations.Contents:China under Hu Jintao: Introduction (T-J Cheng et al. )Political Succession: Changing Guards and Changing Rules (J Fewsmith)Is the Chinese State Apparatus Being Revamped? (Y Huang)Who Does the Party Represent? : From “Three Revolutionary Classes” to “Three Represents” (B J Dickson)Jiang Zemin's Successors and China's Growing Rich-Poor Gap (E Friedman)Information Technology in China: A Double-Edged Sword (T-j Cheng)The Future of SOEs: From Shortage Economics to “Enron-omics”? (X Hu)The Evolution of Elections in China (A E Gadsden)What Does Buyun Township Mean in the Context of China's Political Reform? (Y Liu)China and the WTO: Evolving Agendas of Economic Openness, Domestic Reform, and International Status, and Challenges of the Post-Accession Era (J deLisle)China's Accession into the WTO and China's Financial Markets (K T Liaw)China–ASEAN Relations: The Significance of an ASEAN–China Free Trade Area (A D Ba)New Leadership Team, New Approaches toward Taiwan? (C-c Lo)China's Relations with the United States and Japan: Status and Outlook (R Sutter)Readership: Academics, professionals and policy-makers concerned with political issues in China. As imports from the People's Republic of China (PRC) have surged in recent years, posing a threat to some U.S. industries and manufacturing employment, Congress has begun to focus on not only access to the Chinese market and intellectual property rights (IPO) protection, but also the mounting U.S. trade deficit with China as well as allegations that China is selling its products on the international market at below cost (dumping), engaging in “currency manipulation,” and exploiting its workers for economic gain. Members of the 109th Congress introduced several bills that would impose trade sanctions on China for intervening in the currency market or for engaging in other acts of unfair trade, while the Bush Administration has imposed anti-dumping duties and safeguards against some PRC products and pressured China to further revalue its currency and remove non-tariff trade barriers. China runs a trade surplus with the world's three major economic centers — the United States, the European Union, and Japan. Since 2000, the United States has incurred its largest bilateral trade deficit with China ($201 billion in 2005, a 25% rise over 2004). In 2003, China replaced Mexico as the second largest source of imports for the United States. China's share of U.S. imports was 14.6% in 2005, although this proportion still falls short of Japan's 18% of the early 1990s. The United States is China's largest overseas market and second largest source of foreign direct investment on a cumulative basis. U.S. exports to China have been growing rapidly as well, although from a low base. In 2004, China replaced Germany and the United Kingdom to become the fourth largest market for U.S. goods and remains the fastest growing major U.S. export market. China is purchasing heavily from its Asian trading partners — particularly precision machinery, electronic components, and raw materials for manufacturing. China is running trade deficits with Taiwan and South Korea and has become a major buyer of goods from Japan and Southeast Asia. In the past decade, the most dramatic increases in U.S. imports from China have been not in labor-intensive sectors but in some advanced technology sectors, such as office and data processing machines, telecommunications and sound equipment, and electrical machinery and appliances. China's exports to the United States are taking market share from other Pacific Rim countries, particularly the East Asian newly industrialized countries (NICS), which have moved most of their low-end production facilities to China. This book provides a quantitative framework for policy considerations dealing with U.S. trade with China. It provides basic data and analysis of China's international trade with the United States and other countries. Since Chinese data differ considerably from those of its trading partners (because of how entrepot trade through Hong Kong is counted), data from both PRC sources and those of its trading partners are presented. Charts showing import trends by sector for the United States highlight China's growing market shares in many industries and also show import shares for Japan, Canada, Mexico, the European Union, and the Association for Southeast Asian Nations (ASEAN). This book is an edited volume about China-ASEAN relations with contributions from experts based in China and Singapore. The book includes a few excellent papers that were presented at a conference the editor organized in October 2009 and also two other research papers. They examine China-ASEAN relations from a sub-regional cooperation perspective. The book discusses and analyzes China-ASEAN cooperation in the Greater Mekong River Sub-region (GMS), the emerging Pan-Beibu economic zone, ASEAN's growth triangles, and the hydraulic power sector, as well as China-ASEAN economic relations in the wake of the financial crisis. They carefully review the progresses that have been achieved, examine new policy proposals that have been put forth, and explore problems that exist in all these sub-regional cooperation schemes between China and ASEAN.Contents:Introduction (M-J Li)China's Participation in the GMS Coopertion: Progress and Challenges (C-Y Li & S-D He)The Planning and Challenges of the Pan-Beibu Gulf Economic Cooperation (X-S Gu)Sub-regional Economic Zones in China: Implications for ASEAN-China Cooperation (W-N Li)ASEAN Economic Growth Triangles and Implications for China (S Y Tong & C S K Chong)China's Collaboration with Indochina Countires in Hydropower Development in the Mekong Region: How Far Can It Go? (P-P Phua)China-ASEAN Relations after CAFTA (M Yang & S-H Heng)China's Growing Economic Gravity in Southeast Asia: An Opportunity for Economic Statecraft? (K M Kemburi)Readership: Academics, graduate and undergraduate students, professionals interested in China-ASEAN relations and cooperation. This volume examines the role of Chinese businesses and industries in Asian production networks. By presenting different case studies of the Asian region, the contributors illustrate how China successfully exports the Chinese business model, based on Chinese ethics, social networks and production integration. The contributors also discuss topics such as the implications and ramifications of global product sharing within Asia; the prospects of free trade agreements in Asia; the economic advantages of Chinese family lineage and Guanxi ? an influential Chinese network; collaboration of overseas Chinese with mainland Chinese, as well as direct Chinese business involvement and investment in other Asian countries. International labour migration can be characterized in three ways — as human aspiration, tradition, and necessity. For some people, working overseas is a dream. For others, international labour mobility is a tradition. For a great number of people, however, international labour migration is an economic necessity. It is the only viable solution to realize their basic human right to a decent life. The current financial crisis provides a valuable occasion for the world to re-examine the grand statements of wisdom which dominate the financial world for a long time. The impact is extremely serious as a result of the convergence of a number of factors such as huge current account deficits of the United States, globalization, deregulation, loose monetary policy, and excessive liquidity. This book seeks to address the critical issues in deregulation, derivatives, leveraging, remuneration systems, and rating agencies.This book will also examine Asia's response and why Asian economies have been less affected by the global financial crisis. Are corporate governance, culture, management styles or even a state-led model the main reasons? Would the Asian sovereign funds help to be the last line of defense against the excesses of the crisis? Is the US$80 billion Asian crisis fund envisaged as the first instance of a coordinated East Asian response to the crisis and would this truly underpin the creation of an East Asian regional order? This book reaffims the need for banks and financial institutions to provide value-adding services, exercise prudence and due diligence and pay due regard for societal interest.Contents:Destructive Creativity of Wall Street: Potted History of Banking and Finance In the Shadow of Depression? Financial Engineering or What Can Go Wrong Will Financial Architecture — I Financial Architecture — II Reforming the IMF — From Fire Fighting to Fire Prevention Regulation and Deregulation Back to Basics Counter–Cyclical Measures Some Deeper Issues The East Asian Response: The 1997 Asian Financial Crisis Ten Years After the Asian Financial Crisis — Positive Lessons Learned Ten Years After the Asian Financial Crisis — Negative Lessons Learned Deconstructing the State-led Model Reforming the State–led Model The Global Financial Crisis 2008 Impact and Immediate Response to the Crisis in East Asia Coordinating with the Region and the World ASEAN Economic Regionalism: A Regional Financial Architecture in the Making? Forming an Economic Community A Shift in Power Center? What Now? Coping with Challenges Appendix: Developing an East Asian Business Ethos (by Ho Kwon Ping)Readership: General readers, who are interested to learn more about the financial crises and/or interested in the area studies of China and Japan. Developing Strategies for the Modern International Airport identifies and analyses the primary issues facing the modern international airport, and their role in a global economy. Based on the premise that the aviation industry has a primary and decisive role in the economic and social development of the modern international economy, this book examines the modern international airport and its process of integration into the larger global economy.As the integration of the aviation industry within the larger context of international business grows, there are an increasing number of important airport sites world wide, which are exhibiting the characteristics of what has been called by one authority an ‘aerotropolis', where major airports are integrated into the wider multi business dynamics of cities such as Shanghai or Beijing.Such pioneering developments are indicative of this region and bring with them a host of new issues and challenges for economic development. While international projections of the growth in demand for aviation services suggest that the key region for future expansion will be the ASEAN group of countries, there are marked differences between countries in their overall plans for viable economic development. As a result, the essential raising of funding required for international airport development must compete against other potential development projects all trying to attract the attention of national policy makers. Developing Strategies for the Modern International Airport examines the issues within the context of the development of a new generation of international airports in East Asia. The approach is multidisciplinary, with individual chapters reviewing and analysing the range of strategic issues facing the modern international airport from different perspectives: economic, geopolitical, developmental, demographic and geographic. The book also identifies matters and issues that could form the agenda for further and more detailed examination.The readership will include university and tertiary students engaged in the study of aviation management, as well as aviation economics and economic geography. The work will also be of interest to airport managers and officials employed by key regulative agencies and research centres working in aviation studies. This book highlights the state-of-the-art tourism and hospitality industry in Southeast Asian countries, while also presenting future directions for the industry with an emphasis on decision-making models. It first elaborates on the significant role of the tourism and hospitality industry given the rapid socio-economic and cultural changes occurring in Southeast Asia, before providing perspectives on medical tourism, tourism for seniors and several other developments within the tourism and hospitality sector. Development of Tourism and the Hospitality Industry in Southeast Asia presents scholarly perspectives from researchers across the region and is geared towards world-wide readers in academia, as well as experts from the industry. This vital book examines the effect of the China-ASEAN FTA Early Harvest Program from a Chinese perspective and also from the perspectives of major members of ASEAN. It explores how regional trade has allowed greater market access, increased competitiveness and discusses the benefits and the problems for those involved.